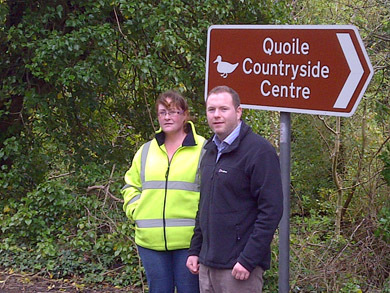 Chris Hazzard MLA looks over the road improvements on the outskirts on Downpatrick on the Strangford Road with a Roads official. SOUTH DOWN MLA Chris Hazzard (Sinn Féin) has welcomed work carried out by the Roads Service to alleviate flooding on the main Strangford to Downpatrick Road. He said: “Some weeks ago I met with Roads Service officials to raise concerns about the persistent flooding on certain stretches of this road. It had become a re-occurring issue in times of heavy rainfall and presented difficulties for road users. “I welcome the action taken by Roads Service to install new manholes at one site and that at another they have gained permission from landowners to pipe water to outlets which I hope will aid the agreed cleansing programme and give a free flow of water.